After-Christmas, Year-End, and Clearance sales during the Spring and Fall are a great time to get some good deals, but you can also end up with a purchase disaster. Don't make the mistake of grabbing the newspaper Ad and rushing to your local consumer electronics retailer without arming yourself with useful knowledge and tools to get the most from your dollar. Sell any overstock still taking up too much shelf space. Sell items that are soon to be on the clearance list. Turnaround gift returns/exchanges (opened and unopened). Sell through old display models. Sell old products that have been to service. Overstock items are usually loss leaders, such as those $29 DVD players, $49 Blu-ray Disc players, $199 LED/LCD TVs, $249 budget home theater packages, and $149 soundbars, that are still new and in sealed boxes. Here you know that they haven't been opened, returned, or used. These may not always be the best known name-brand models but can be a good value. Overstock items are usually the first to go, especially in an after-Christmas sale. This means you have to get get to the store early for the best chance to grab one. Every January, the CES is held at which many consumer electronics manufacturers unveil their products for the coming year. Buyers from big consumer electronics retail chains to small regional and hometown independents place orders at CES for new products which start to hit shelves in February and continue into the Spring and Summer. In order to beat the competition in placing newer products on store shelves, retailers must clear out current products targeted for a replacement as quickly as possible. This is where the consumer can benefit. If a retailer made the "mistake" of over-estimating demand for a specific AV receiver and has lots of stock left by February, it will be more difficult to move the older model as its competitors, who didn't over order stock on the old model, sell the newer model when it arrives. However, many consumers don't react well to the word "Clearance", which gives the connotation that the product may be, in some way, inferior to a newer model (that may or may not be the case in reality). Therefore, the promotion of the old model often carries an Ad notice of a "Price Drop", "Instant Discount", "Instant Rebate" or even "Special Purchase". Also, an additional indicator of a clearance item is in the fine print; check for the phrases "While Supplies Last" and/or "No Rainchecks". If you are bargain hunting, the retailer gets rid of a product that will soon be discontinued and the consumer gets a great price, especially if you don't need the latest and greatest and the product has everything you need. Make sure the product meets your needs by checking out the features ahead of time on either the manufacturer's or store's website and that you know how to interpret weekly newspaper and online ADs. Stores want to turn around returns and exchanges as quickly as possible. You received Blu-ray player as a gift from your significant other and another one from your parents. You decide to take one back to the store and exchange it for something else. Stores don't mind you returning the Blu-ray player and exchanging it for something else. However, the store is getting stuck with something they thought they sold permanently, and if the item is returned it will take up store real estate that needs to be devoted to other products that can be sold at a higher profit margin. The solution is to put it back on the shelf and mark down the price 5% to 15%. Check for a discounted price sticker made by the store on the box and confirm with a salesperson or store manager that the open box price is indeed a discount price for the same item brand new. Check the contents of the box yourself, together with a salesperson or store manager. Make sure there is an owner's manual for the product and all accessories for the product are present. Note how the accessories are packaged. Are the cords, remote, and manual in their original packaging (which may indicate the product may not have been used), or are they obviously repackaged (which would most likely indicate the product was used for a period of time)? Lastly, if anything is missing, negotiate a lower price that would make up the price of the missing items. If the box has been opened, ask to see the item plugged in and working before you leave the store. Check to see if there is a date code on the open box label or price sticker. This won't tell you how old the product is, but it does tell you how long the item has been sitting on the shelf as open box item. Typically, most products at consumer electronics retailers are on display anywhere from 90-days to six months or even as long as a year. Many retailers will not accurately inform the consumer as to how long a product has been on display and won't discuss how the item has been treated by sales staff and customers. Camcorders, digital cameras, TVs, and video projectors are especially suspect because, not only have they been on display, but they have been on and running for twelve hours a day for months, with camcorders and digital cameras being handled and bounced around by everyone from gentle grandmothers to small children. 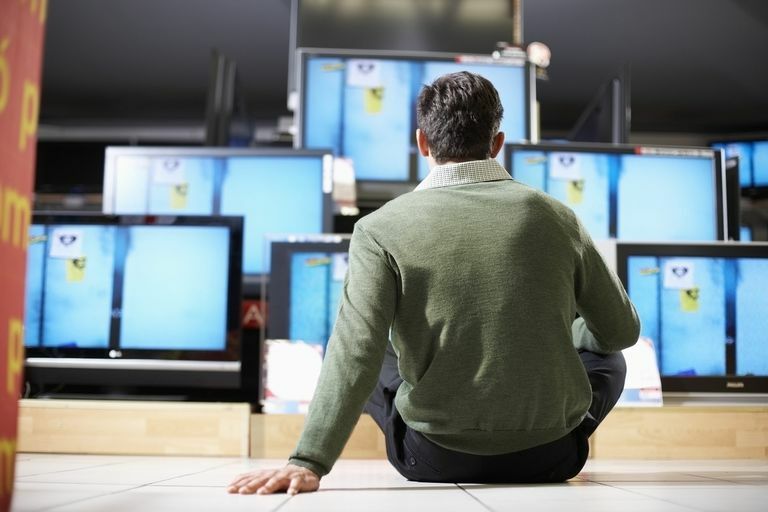 However, other display items, such as home theater receivers, DVD players, and Blu-ray Disc players don't get quite the same abuse as they are only turned on when a salesperson actually demos the products. In fact, most displays of AV receivers, DVD players, Blu-ray Disc players, and other related components are usually just sitting on a shelf as showpieces with no power and can't be used by the consumer anyway without sales staff assistance. Can you return the item if it is found to be defective? Can you purchase an extended service plan for the unit, if you choose too? Are all the accessories and owner's manual included? If there is a price already marked for the unit, check to see that it is a least 15% off its original price, if any accessories or owner's manual is missing, negotiate a lower price, reflecting both the cost and availability of the missing accessories. One great negotiating strategy to get a good price on a display model is to indicate that you would be willing to purchase an extended service plan on the unit and/or some additional accessories to go with it. The store can set the price on a display item how it sees fit but you shouldn't settle for the posted price. There is no specific legal guideline that can determine the value of a product based on how many people have touched it, how long it has been on, any scratches or dents, etc.. from it being on display. The store can sell such items for any price the store or district managers choose to as long as they don't violate store or corporate policy. There is no guarantee you will get a better deal using this strategy, but it is certainly worth a try. With some firm negotiation, you can, potentially, get a good price on a display item, still get some protection for it and/or needed accessories with the purchase. It all boils down to whether the product, the negotiation time, and the final price are really worth it. Products that were in service, brought in by customers, that were never claimed after they were repaired. Displays that were damaged in some way, repaired and sent back to the store to either put back on display or sell as a discontinued unit. Service plan exchanges. This includes products that were previously owned by customers but required several repairs within a specified time period. In such cases, many service plans give the store and/or the customer the option of having the unit repaired again or exchanged for an equivalent current replacement unit. At this point, the service department determines whether to just dispose of the unit, send it back to the manufacturer, or service the unit again and try to sell it as an "open box" item. How can you tell if you are looking at a service comeback? The product should have a service sticker (a sticker which looks similar to a UPC code but is placed on the unit itself). However, chances are, the salesperson or manager will not tell you the product's service history. One way to find out if something has been returned from service is to check if an open box label is next to, or partially over, a service label. If the item has several labels stacked on top of each other (like when you put the latest year's car registration tag over the previous year's tag), there is a good chance that it has been serviced, and/or repriced several times. In many cases, the service dept doesn't give the repair history information to the sales staff. In addition, many times the accessories and owner's manual are no longer with the unit and, in fact, the owner's manual may not even be available (although there are online services you can try). To make matters worse, sometimes these items may be over two years old. If you choose to buy a product service comeback, look it over very carefully and don't conclude a final purchase without seeing the product in working condition. Follow the same guidelines outlined previously on purchasing exchanged items. Many times, sales on such items are as-is, the store sale is final (no return), and the store may not consider the purchase of an extended service plan for the item because of the age and repair history of it. Purchasing a product service comeback is a gamble, but if you are adventurous and a determined negotiator, you may get lucky and get something that is actually practical for your needs. Well, there you have it, some of the secrets of retailing that may be useful to you in your search for that elusive After-Christmas, Year-end, or Clearance bargain. However, before you go shopping, eat a hearty meal (you will need the mental energy), relax, have fun, but be on guard, and be ready to negotiate. Don't jump into a purchase without taking a closer look! There is also another bargain shopping strategy you can take advantage of – Buying Refurbished Products.